GRANBURY, Texas – Bond Arms, best known for manufacturing the finest double barrel handguns in the world, has teamed up with Buck Knives to produce a Signature heavy duty, a useful knife for your pocket and a high quality knife perfect for self defense needs. This assisted knife, which is made in the USA, features a stainless steel blade and offers effortless one-hand opening. It fits perfectly in your back pocket while the removable pocket clip allows for quick and easy retrieval. You can choose from a handsome black ash or rosewood grip that perfectly matches the grip on your Bond Arms handgun and the Bond Arms logo is embossed right into the wood. At only $60, this durable, perfectly weighted knife is a great addition to your collection. Bond Arms has been manufacturing 100% Made in the U.S.A., derringer style firearms, since 1995 and is recognized for its dependable, well-built double-barrel handguns, which feature historically inspired designs. They are trusted firearms for personal protection as well as cowboy action shooting. Bond Arm derringers have been the Single Action Shooting Society (SASS) World Champions for 10 years in a row. Their most popular models, including the Snake Slayer, Snake Slayer IV, Texas Defender, Cowboy Defender and Ranger, are compact pistols that pack a big wallop. But what might be even cooler is the fact they have multiple personalities. Bond offers 15 interchangeable barrels for their guns, which gives shooters 23 different caliber combinations including popular choices such as .410 shot shells or .45 Colt cartridges, and changing the barrels is a snap. A standard allen wrench allows you to remove the hinge screw so you can change out the barrel in about a minute. 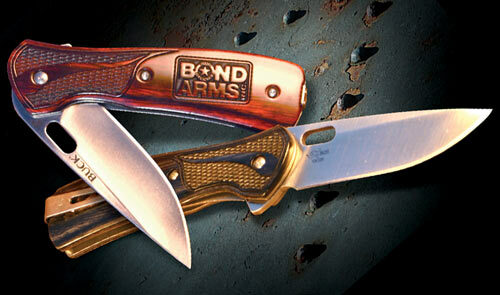 For more information about Bond Arms visit http://www.bondarms.com or call 817-573-4445.